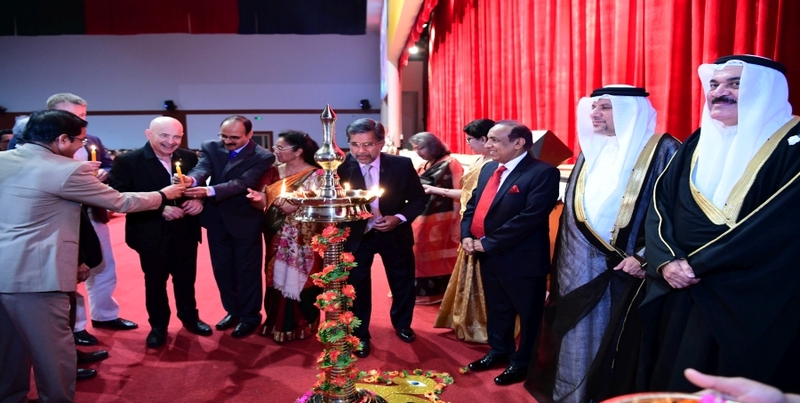 NMS-DPS Bahrain is run under the aegis of the Delhi Public School Society. Affiliated to the CBSE, the school aims at an all-round development of student’s personality so as to enable them to be future leaders. The school has strength of approximately 1746 and is divided into the Junior, Middle and Senior Wings. Besides academics, the school also offers a whole plethora of activities to hone the talents of the students. It has, a Basketball Court, Football Fields (for junior & senior players), an Athletic Track, Cricket Practice Pitch, Badminton Courts, Long Jump Pit. There are many activity clubs, to name a few - Public Speaking, Dramatics, Art and Craft, Computer, etc. Students have participated and won many Inter School competitions at the Inter School and International levels. 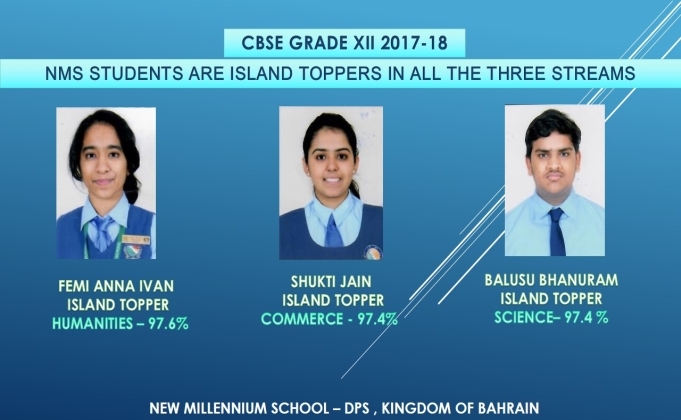 In the recently declared results of grade XII by the Central Board of Secondary Education, New Delhi, India , New Millennium School students from Bahrain emerged as Gulf Toppers in the Humanities and Commerce streams. 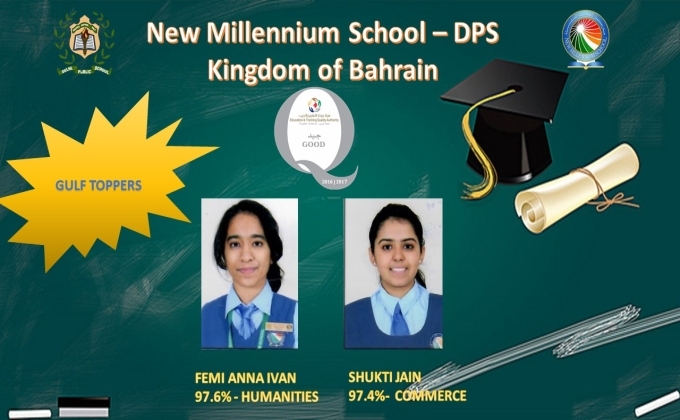 27 students of New Millennium School – DPS Bahrain, after excelling in the regional round in February, emerged successful in the junior category of the Global Round - Barcelona from July 21st to July 27th 2018. New Millennium School excels in Grade X CBSE Examination 2017-18. New Millennium School – DPS students secured a 100 percent success rate in All India Secondary School Examination conducted by CBSE in March 2018. NMS – DPS Excels in CBSE Grade XII Examination. 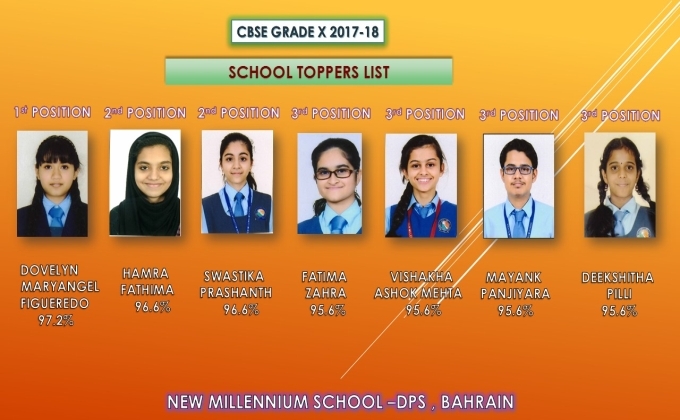 The New Millennium School-DPS Bahrain has yet again proved their mettle in All India Senior School Certificate Examination (AISSCE), conducted by the Central Board of Secondary Education (CBSE), New Delhi, India in March 2018. The best lessons of my life have been taught by the teacher called ‘hardship’. Nothing can stop you if you have a dream and commitment to realize it. Money can buy anything in the world but knowledge, Prudence and wisdom come only with persistent hard work & dedication. Education is the biggest gift we can give our children. Education is the foundation laid for the future. It is the best investment to ensure a better world. Teacher, student, parent are the three angles of a triangle. A perfect link between them is important for holistic education. Change is a Universal Law. Children mould into the shape we give them, so guide them well. To be a good teacher, become the best student. We must reach before we teach; practice before we preach; think before we speak. Blaming others is excusing yourself. If each one becomes responsible for his/her behaviour, the world will be a better place to live in. It is important to read. This is complete only when we think, reflect, analyze and finally pen down our thoughts. Co-ordination of thoughts and actions is vital. It is paramount to develop a sense of pride and behold the beauty within. Remember love is the strongest force in nature, stronger than the natural forces. If you feel there is a dearth of role models for our children today, be the one.